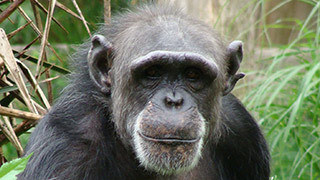 Together with gorillas, chimpanzees are the only non-extinct species of great apes living exclusively in Africa. Their habitat is primarily central Africa where large groups live in the jungles of Congo, they're closely related to the bonobo. They're also humanity's closest living relative having over 90% identical DNA.